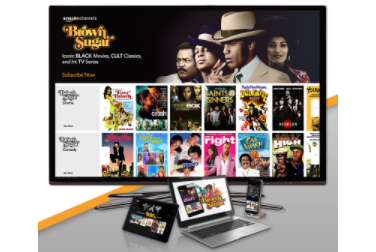 Amazon has added Brown Sugar, the new subscription video-on-demand service focusing on African-American movies, to its Amazon Channels offering. The move means that Amazon Prime members can watch Brown Sugar’s catalogue of movies on the Amazon Channels service. Prime members will be able to purchase a subscription direct, which will also give them access to the service via the BrownSugar.com website and other devices, with a seven-day free trial. The service is available for US$3.99 thereafter. Brown Sugar, owned by African-American TV network Bounce, was described by Foxy Brown and Jackie Brown star, and Brown Sugar spokeswoman Pam Grier as “Netflix, only blacker”. The service eatures movies incuding Dolemite, Shaft, Cotton Comes to Harlem, Foxy Brown, In the Heat of the Night, Blacula, Cleopatra Jones, Crash, Cooley High, Which Way Is Up?, Hammer, Black Caesar, Richard Pryor: Live on the Sunset Strip, Car Wash and The Original Gangstas. The service also includes original programming and features complete seasons of the Bounce television network series Saints & Sinners, Mann & Wife, Family Time, In The Cut and Ed Gordon. The service also carries Premier Boxing Champions on Bounce. Brown Sugar is currently available on Apple TV, Roku, Amazon Fire TV, Amazon Kindle, Android and Apple smartphones and tablets and web browsers via BrownSugar.com. The service went live at the end of last year.